Seoraksan is the third highest mountain in South Korea, after the Hallasan volcano on Jeju Island and Jirisan in Gyeongsang Province. It is the highest mountain in the Taebaek mountain range, which often considered the backbone of the Korean peninsula. Many Koreans believe that Seoraksan is the most beautiful place in all Korea. South Korean tourists and thousands of mountain hikers visit Seoraksan every year. The hotels and conference centers at Mt. Seorak also host hundreds of conferences throughout the year, with both Korean and international participants. 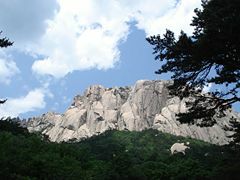 Seoraksan means Snow Rock Mountain, and the mountain has also been known as Seolbongsan (Snow Peak Mountain) and Mt. Seolsan (Snow Mountain). 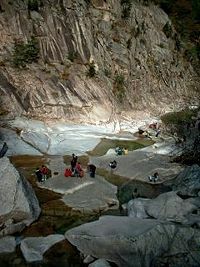 Although Seoraksan is not topped with snow all year, it is often covered with snow from the mid fall until late spring. Mt. Seorak's highest peak, Daecheongbong (Great Green Peak), at 1708 meters (5,603 feet), is the highest peak in the Taebaeksan range, and the third highest in South Korea after Hallasan (1,950 m) and Jirisan (1,915 m). Seoraksan contains a whole series of additional peaks, part of the Taebaeksan mountain range that stretches along the east coast of Korea and branches off inland to the west. A view of Ulsanbawi from a distance. The ridges extending north and south from Daecheongbong divide the park into Nae (inner) Seorak and Oe (outer) Seorak, with Outer Seorak being the section closest to the sea. Inner Seorak has smoother slopes and rich vegetation, while Outer Seorak has steeper slopes and less wildlife and plants. Seoraksan is covered with beautiful spots, including striking rock formations, bubbling rocky streams and waterfalls. The mountain offers distinctive beauty in each of the seasons, with millions of azaleas, forsythia and other spring flowers, followed by the greens of summer, brilliant hues of autumn and it turns to a magical wonderland in the winter. 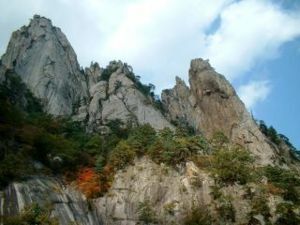 Seoraksan's steep cliffs are often decorated with wisps of fog and mist. 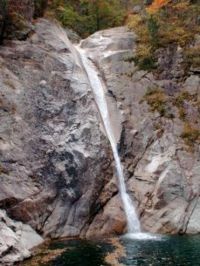 The Yukdam waterfall and the Biryeong (Flying Dragon) Waterfall are located on the left side of the mountain's main valley, about a forty minute walk from the main car park. The pool at the base of Biryeong Waterfall is deep and ideal for swimming. At the end of the valley is Biseondae (Flying Fairy Platform), a huge, slanting rock with a stream flowing over it. Above the stream is a difficult to reach cave, which offers amazing views of the surrounding rock formations. Seoraksan's spectacular Ulsanbawi rock formation can be reached by hiking past two temples and climbing 800 steps up the face of the rocks. Ulsanbawi has six granite, quartz and mica peaks that rise as high as 873 meters, covering an area 4 km in circumference. According to the legend Ulsanbawi comes from the city of Ulsan in the south east of Korea. 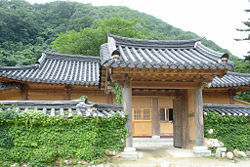 As Kumgangsan was built, Ulsanbawi walked to the north as the representative of the city. Unfortunately Ulsanbawi arrived too late and there was no more room. Ulsanbawi was ashamed and slowly trudged back to the south. One evening the rock went to sleep in the Seorak area. Ulsanbawi felt it was so beautiful around there that it decided to stay for good. On the way to Ulsanbawi is the spherical rock Heundeulbawi (Tottering Rock). About five meters high, the rock looks like it will roll down the cliff with just a small push, but even though thousands of people have tried to budge it, it does not move, just wiggles a little, no matter how hard people push it. 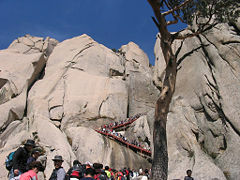 Other distinctive rock formations on Seoraksan include the Cheonbuldong valley. The name (Cheonbuldong) means 1,000 Buddhas. Not much imagination is needed to see naturally formed Buddha statues in the rocks that dominate the forest. Gwongeumseong are high rocks, to the south of Sogongwon, named after two men, Mr. Kim (alternate spelling=guem) and Mr. Gwon, who used the rocks to hide during the Korean war. It takes 8 minutes to travel to Gwongeumseong (12km), by cable car. From the top, you can catch a magnificent view of the Ulsanbawi rock formations, as well as the Gongnyongneungseon (Dragon Ridge line), Cheonhwadae, Madeungnyeong, and Jeohangnyeong. Seoraksan is located in Mt. Seoraksan Nature Reserve near the city of Sokcho, within the Gangwon province in eastern South Korea. Mt. Seoraksan Nature Reserve was designated a natural monument in 1965, giving protection to the flora and fauna contained in the 163.4 square km area surrounding Daecheongbong. In 1970, the area was expanded to 354.6 square km, and made a National Park. The park contains 28 peaks, 58 valleys, two hot springs, twk mineral springs and numerous stunning rock formations. Twelve Buddhist temples are located within the park area. Seoraksan's forests contain both deciduous trees and evergreens, and are the habitat for 939 different species of plants, 25 species of mammals, including bear, deer and antelopes, 90 species of birds, 11 species of reptiles, nine species of amphibians, 360 species of insects and 40 species of freshwater fish. In 1982, UNESCO designated the surrounding area including Mt. Seoraksan National Park as a Biosphere Reserve to protect the diverse flora and fauna. The park attracts many national and international tourists all year round, but the main season for the Seoraksan national park is autumn. The autumn colors in the area are considered amongst the most beautiful in Korea. The red and yellow forest is interrupted by rocks and small mountain streams flow amidst this. During the rainy season in summer—especially after a typhoon—these streams can swell. The Outer Seorak section of the park, the most accessible to visitors, contains Sinheungsa Temple, Ulsanbawi and Heundeulbawi, as well as the Biseondae promontary and the Biryongpokpo waterfall. Perhaps the most visited part of the mountain is the main entrance valley to the National Park, fifteen minutes drive from Seokcho city. The valley runs west to east with a paved road leading up to the park's entrance gate. This valley contains many beautiful sites and is well worth a day visit. The sights in Inner Seorak can be reached only by a long hike. Those who are prepared for the strenuous 8.5 km hike to the Baekdam (Hundred Pool) Valley can see Baekdamsa Temple and the Daesungpokpo waterfall, 88 meters in height, and the nearby Ongnyutang waterfall. Baekdam Valley and Baekdam Temple are named for the 100 pools of water between them and Seoraksan's main peak, Daecheongbong. Sinheungsa Temple, sometimes spelled Shinheungsa, was built in the sixth year of Queen Jindeok (652)of Silla Dynasty, by Jajang, a great Buddhist Master who studied Buddhism in Tang China and then founded many temples during the Silla period. Located just a short walk from Seorak National Park's main entrance; when built, this historic temple was the first Seon (Zen) temple in Korea. Now it is a head temple of the Jogye Order of Korean Buddhism, the headquarters for 40 branch temples in the northern part of Gangwondo province. The temple was first constructed to the east of Norumok, with a nine-story pagoda to enshrine the sarira of Buddha, and it was named Hyangseongsa, which was later changed to Sinheungsa. It burned to the ground in 699, and was rebuilt by Uisang. It burned again in 1645. 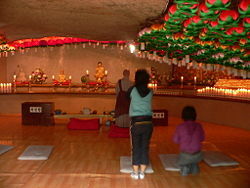 Visitors can also see the attached temples, Gyejoam, Naewonam, Anyangam and Geumganggul (cave). Baekdamsa Temple was also built by Master Jajang, in the Nae (Inner) Seorak area, in 647, and named it Hangyesa. It was later renamed Baekdamsa by King Sejo of Joseon. The temple became famous after the poet Han Yongun was ordained as a Buddhist monk at the temple in 1905. Baekdamsa Temple is located in Inner Seorak, in the Baekdam Valley. Temple in Seoraksan National Park. Large Budda statue at main entrance to Seoraksan National Park. This page was last modified on 28 September 2015, at 19:23.